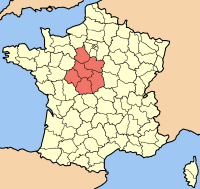 Centre-Val de Loire is a region of France. Its capital is Orléans. 2.5 million people live there. 225,000 of them live in the urban area of Orléans. Centre-Val de Loire Facts for Kids. Kiddle Encyclopedia.